After checking out one of my favorite sites “Style Like U” I knew instantly I had to share this with all of you. Meet Lizzy and Darlene, sisters originally from Nigeria. They are the founders and designers of their William Okpo label (the line is named after their father) currently sold at Opening Ceremony (sigh, I love this store but most of the items can be tight on a girl’s pocket). Check them out at http://stylelikeu.com where you can see them in action along with many more photos. If you are feeling the pictures above you will definitely not be disappointed. Your so welcome:) I agree they have some amazing pieces. Very talented young ladies! 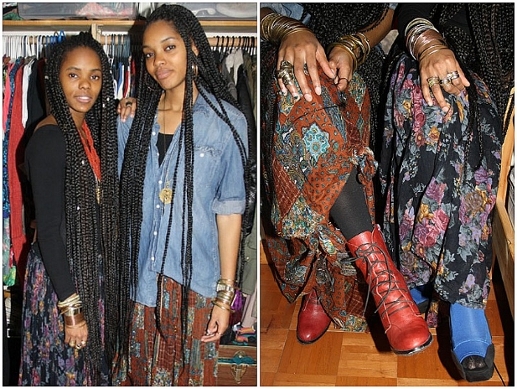 I need to print this picture, I want to rock those braids so HARD this summer!! I love their braided look so beautiful! OMG. These are the girls from the other picture that everyone wanted to know about. The braids is what made me do a double take. They are gorge. AH, I (you) found them! So do they have extensions? I really hope not. I would noot have the patience to do braids if my hair were that long! I’d love to hear their regimens. 100% kanekalon hair it comes as long as 48 inches. you guys are gorgeous… yay nigerian chicks!! !